When trying to lose weight eating breakfast is important. But, when you are a mom on the go it can be very easy to hit the Starbucks drive thru instead. 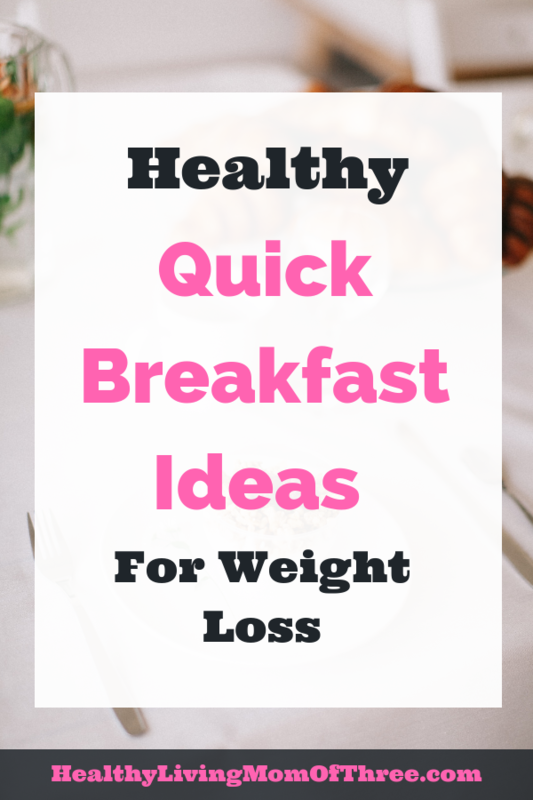 Take the time to make a healthy quick breakfast at home. You can control the ingredients, making it better for your weight loss goals. 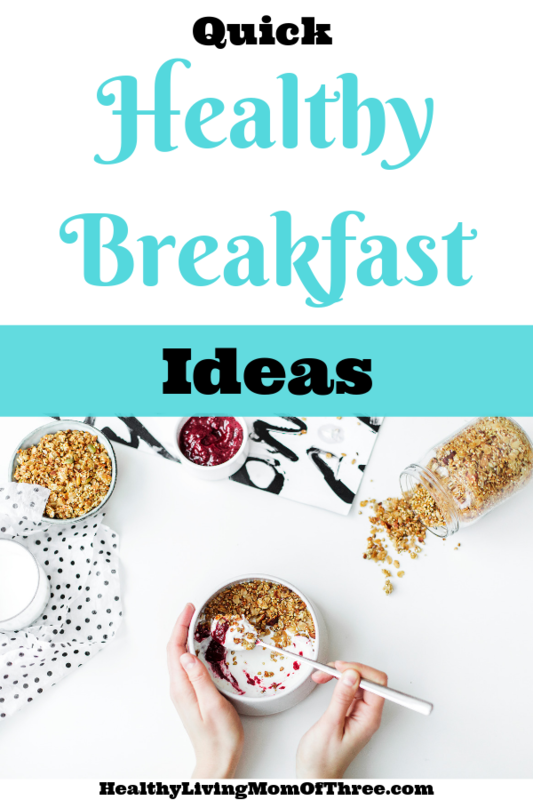 So, I came up with a list of 10 breakfast ideas that are not only healthy but are quick and easy. What should you eat for breakfast when you are trying to lose weight? Eggs are great for weight loss. They are packed with protein and eggs will keep you full. The great thing about making hard boiled eggs is you can prep these ahead of time. I have seen people do this in their Instant Pot for perfect hard boiled eggs every time. I make a bunch of hard boiled eggs on Sunday for my family and they keep in the fridge for a few days. You can swap for whole eggs here too! But, an omelette is a great healthy quick breakfast option. Eggs take just minutes to cook. To save time in the morning have your veggies prepped ahead of time. When I get home from the grocery store, I will wash all my produce and chop up anything that I can to save time during the work week. Simply throw your veggies in a skillet to soften, add your eggs and your done. Eggs should be a staple in your healthy breakfast menu. Avocado toast is a great healthy quick breakfast option! Especially that it comes together in minutes and there is no right or wrong way to make it. Once you have your avocado spread on top add whatever you have on hand. This is where those hard boiled eggs come in handy too! Slice some on top or add some sliced tomato. You have yourself a filling yet very nutrient packed breakfast. I’m extra! If you have not tried Everything But The Bagel Seasoning from Trader Joe’s – you are missing out. I use this seasoning a ton in my meal prep but on avocado toast it is to die for! Breakfast smoothies come together super fast in the morning. I personally have prepped these the night before but find sitting overnight is not for me. That doesn’t mean you can’t give it a try though. I found having my greens and fruit washed and cut up is a better option. That way in the morning I can just throw it all in my blender over ice and I am done. My personal favorite weight loss breakfast smoothie is baby spinach, banana and blueberries. It’s a great way to start the day with all those micro nutrients first thing. This is a staple for me, I love oatmeal especially for breakfast. You can buy plain quick oats that only take a minute or two in the microwave. I like to add a dash of cinnamon for an extra metabolism boost. You can add berries or anything you’d like here. If oats are not your thing you can prep overnight steel cut oats. Either way oats are a very filling healthy quick breakfast idea. I love prepping these and yogurt parfaits store nicely. When you are trying to lose weight try a Greek yogurt instead. They contain a little more calories but with a higher protein its certainly a healthier choice. Layer your yogurt with your favorite berries and granola for some crunch. Another make ahead healthy quick breakfast option. Breakfast burritos store very nicely when you freeze them. Grab your favorite burrito tortilla, scramble up some eggs and meat of your choice. Throw in some veggies for micro nutrients. You can make several of these at a time and then roll them in plastic wrap followed by aluminum foil and freeze them. To defrost simply take one out the night before and place in your fridge. Simply unwrap them and place in a slightly damp paper towel. Heat them up that morning and enjoy. If you see a theme here, it’s protein. Protein especially in the morning will keep you fuller longer, so it’s perfect when trying to cut calories. A simple protein shake in the morning sometimes is all you need. I actually like to make my iced coffee a protein iced coffee. Since hot coffee is not my thing it works great! All I do is all a scoop of protein powder in with my coffee and almond milk. Shake in a blender bottle and I am good to go. Adding the protein powder also adds sweetness, so I am eliminating all the added sugar in my morning cup of coffee. Just like with the breakfast burritos these homemade Egg McMuffin store very nicely in the freezer. I will use a muffin pan to make individual egg “cups”. In there you can add veggies, meats and cheese. Bake them at 350 for about 30 minutes. Add them to an English Muffin for a homemade and healthier version of the Egg McMuffin. Same goes for storing and defrosting. Wrap them in plastic wrap followed by aluminum foil. Place them in the fridge to defrost. Unwrap it that morning and microwave in a very slightly damp paper towel. It doesn’t get any better than a good old hash brown with eggs in the morning for breakfast. But, by swapping them for a sweet potato makes them healthier and more nutricous. These store nicely for a few days in the fridge. All you need to do is add some fresh eggs in the morning and you are done. Check out this Sweet Potato Hash with Sausage and Eggs recipe from Paleo Running Momma. Sign up to get your 2 FREE HIIT Fat Blasting Workout Cheat Sheets! Once signed up you will automatically get freebies from us! This post may contain my affiliate links. Read my full disclosure.